Stress is not my friend. Stress does not like me At all. Stress has attacked me with a vengeance this month, now, when I need to be at peak performance mode. I started back at uni this term loaded with the cold, but pressed on regardless. I am set for my busiest period ever at uni, and just did not have the time to stop and let my body rest properly as it needed. My stress levels continued to rise, culminating in a spectacular meltdown in the RCS cafe (Thanks for shielding my ugly crying face, Rosie), and I am now sick for the second time in as many weeks. All this stress and illness has taught me something: I am not designed for, nor do I want to be, being busy and running at 110% at all times. It just doesn’t work for me. I thought I wanted to be the ultimate boss babe, ruling the world, but in being forced to stop and slow down by my health, I’ve realised that what I truly want is to live quietly. To make ripples upon the world, knowing they will transform into the waves I believed I wanted to make. 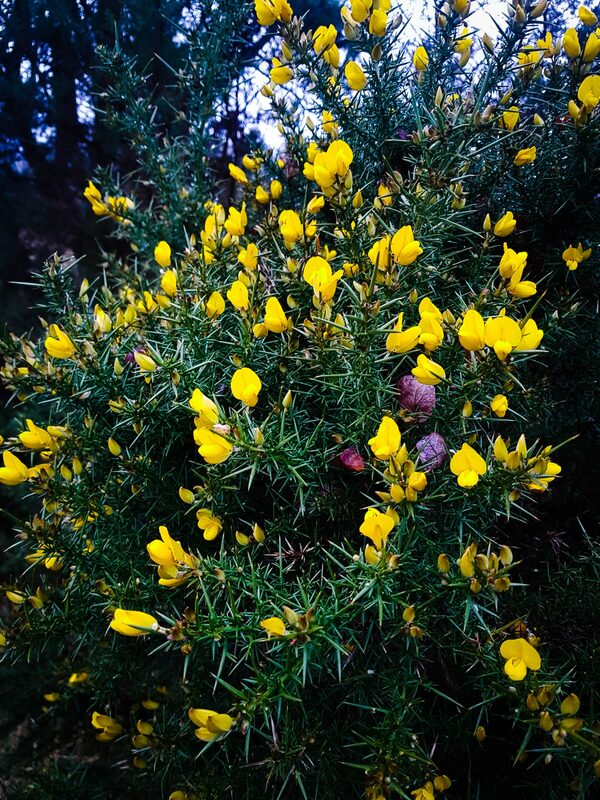 I put out feelers recently to get a little feedback on the blog, and resoundingly people wanted to see more of my Scottish content on the blog. Knowing this, and knowing that I needed a break, I planned myself a new adventure. 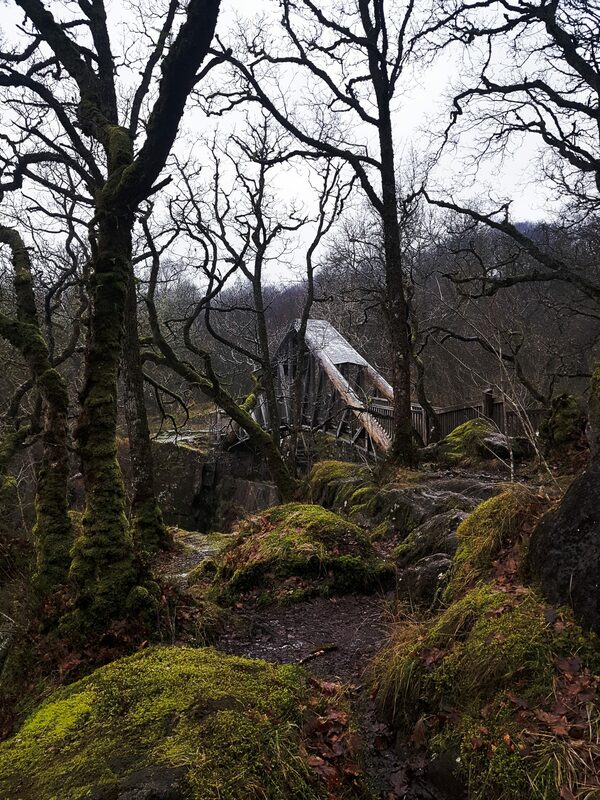 I came across a few photos of the bridge at Brachlinn Falls on Instagram, and decided that it seemed the right destination for me; I’d get content for Instagram and the blog, and the walk would be good for me in terms of getting my body moving and my mind quiet. Quiet is the word I would use to describe my walk to the Falls. The access road is a tad terrifying if, like me, you can’t actually see the front of your car. 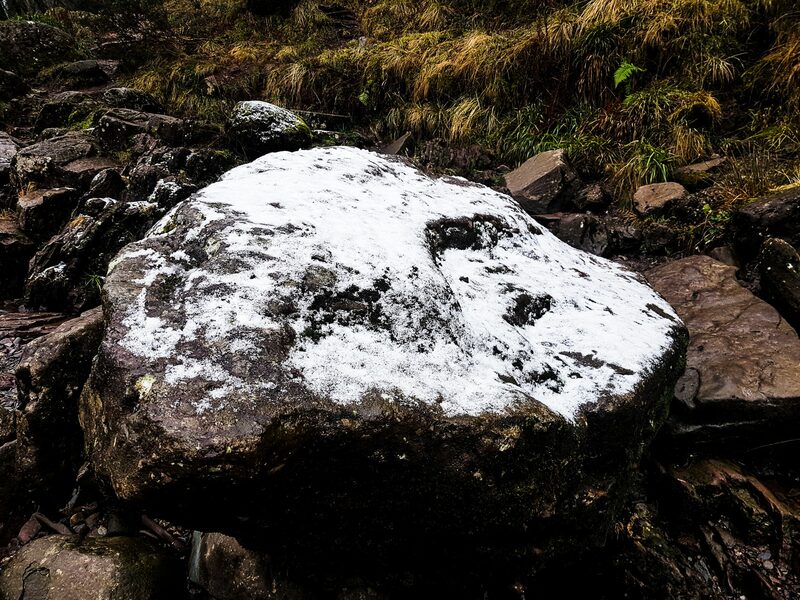 It’s single track, the’passing places’ aren’t actually that wide, and there there are several spots where you could potentially get your car stuck in a ditch. I would, however, absolutely recommend that you stick it out and park in the upper car park designated for the Falls. it’s a steep, steep incline to walk up if you park in the lower car park. 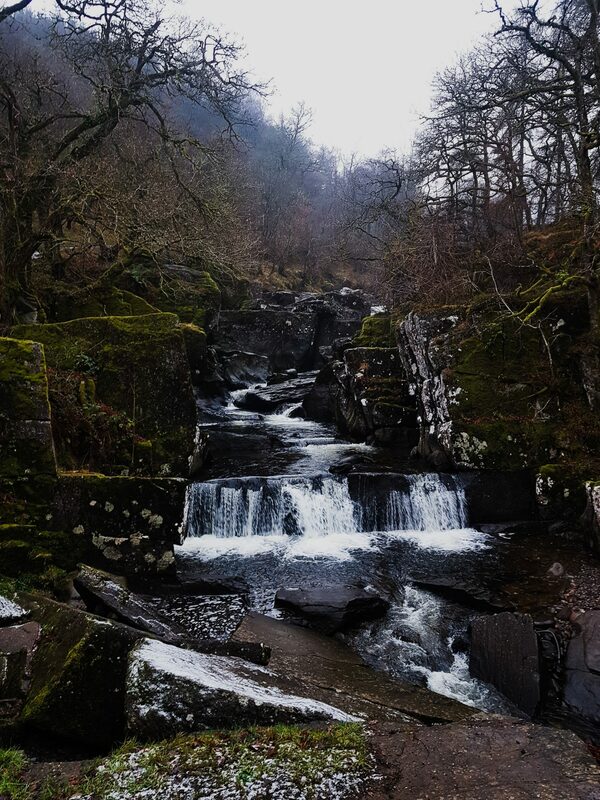 I will probably return to Brachlinn Falls in the brighter seasons, as I can imagine the views are quite spectacular, but the mix of clouds and mist made for an entirely different kind of atmosphere on this particular walk. The silence was utterly deafening. Yet, there was nothing unsafe about it. 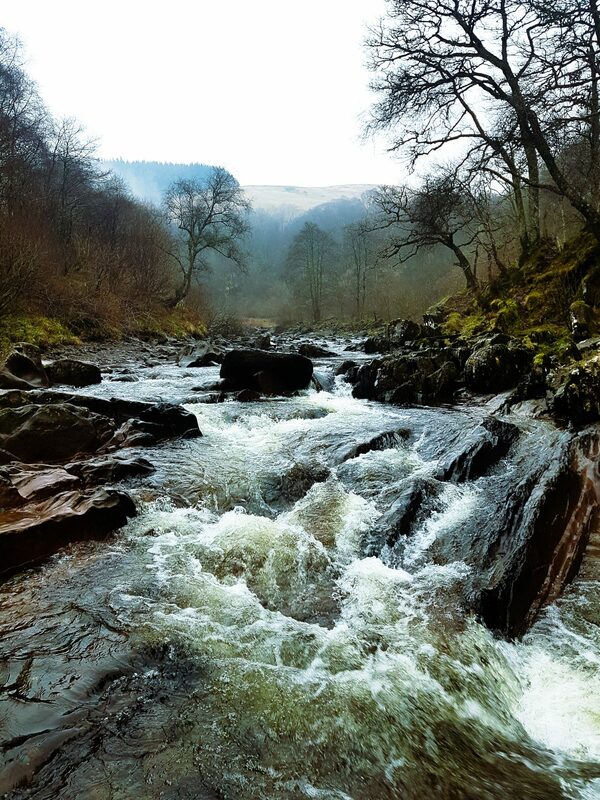 I felt completely serene and at peace trudging the half mile path from the car park to the Falls. 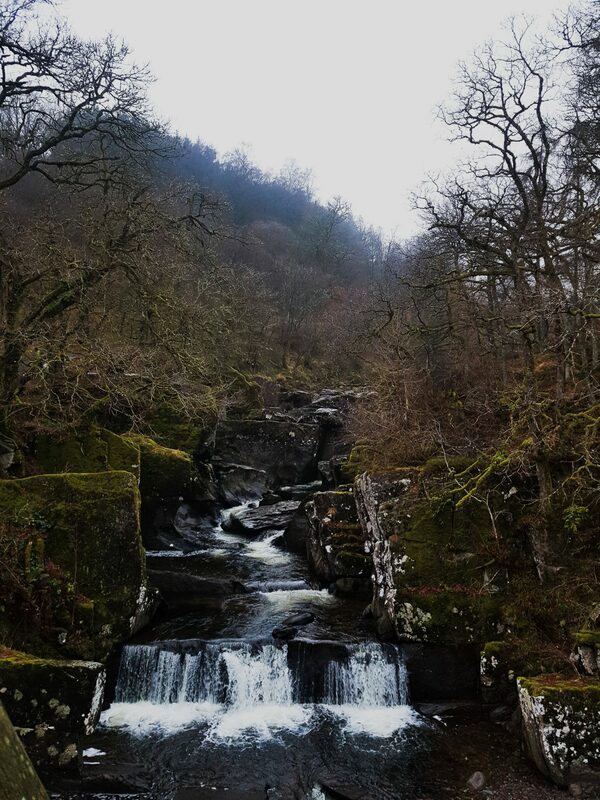 It is only as you reach the beginning of the descent to the Bridge that the thunder of the Falls breaks the silence, flooding your senses with noise. Recent flash flooding completely reshaped the gorge over which the new, award-winning Bridge now spans, and several areas of rock and mud make for excellent viewing platforms for this spectacular structure. 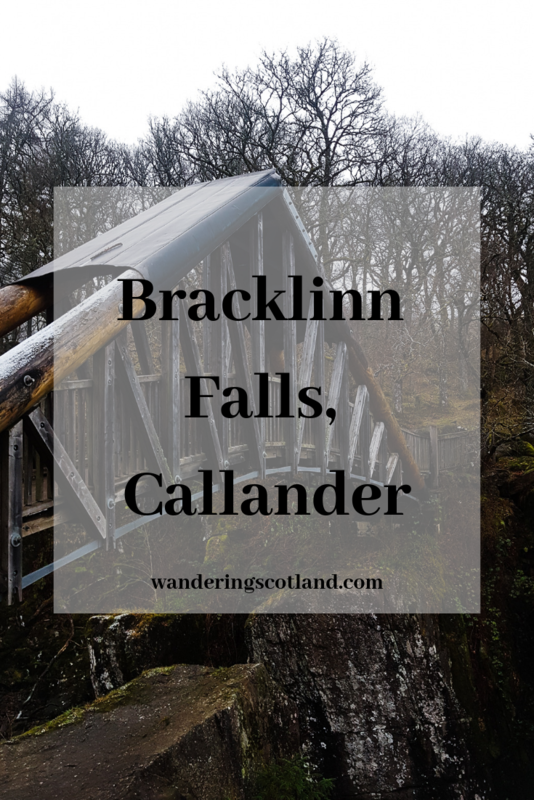 The best view of Brachlinn Falls themselves can be found from the Bridge, or the rocky outcrop just below, depending on the angle you desire for your photography. The walk back from the Falls seemed decidedly shorter than the wander down the hill, which seemed odd given the steep nature of the incline. It was one of those wierd time paradoxes where you seem not to be moving and yet speeding along all at the same time. 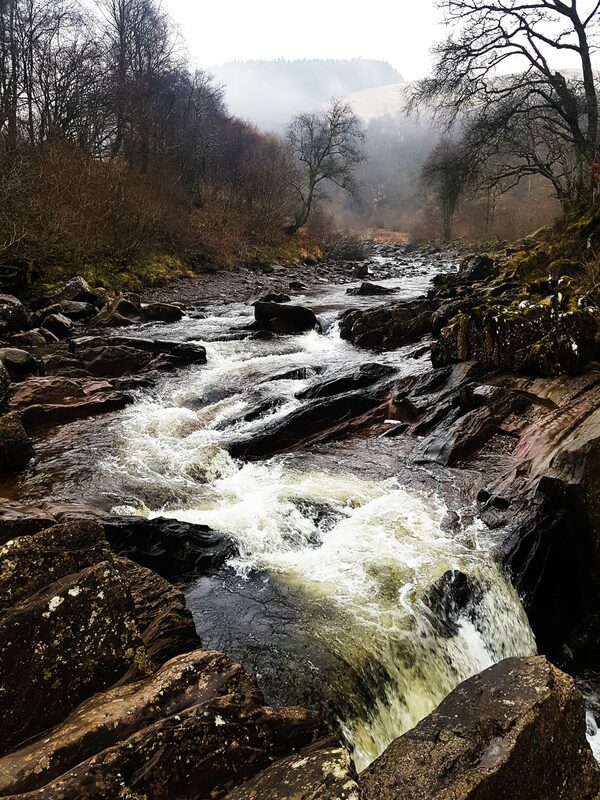 The visit to Bracklinn Falls was exactly what I needed at the time; a peaceful place and time for quiet contemplation, and after, it was time for sitting quietly with a good book and a warm cup of tea. Chill time, to allow all of the benefits of my walk to sink in and soak into my body. Did you guys know I’ve started a newsletter? Sign up for a fortnightly update of what I’ve been getting up to, what I’ve been reading, and where I’m going next. Next postMy Favourite Scottish Castles.